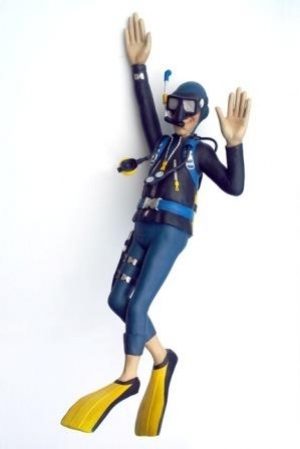 Our 2.31m Funny Swimming Scuba Diver is ideal to be used within any Scuba or Diving shop, he can be suspended horizontally or vertically or against a wall. This is a fantastic model to advertise any scuba business. 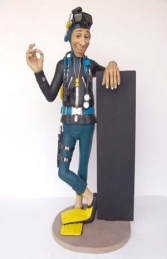 The details on this life-size Funny Swimming Scuba Diver are excellent; you would never believe his wetsuit, fins, stab jacket and knife were all made from resin..we have made this model with humour in mind; he is a great character. This swimming model is ideal to suspend at any angle from a ceiling in a shop or swimming pool area, and looks fabulous with our 8ft and 4ft shark and orca models.